Back in 2009 Dutch travel photographer Thijs Heslenfeld contacted me to let me know that his latest photo book is due out soon. Hot - Life in the Australian outback, came hot of the press in November 2009 and was instantly (Jan 2010) voted the best Dutch photo book of 2009. Now, before I tell you about the book, I have to tell you that I know and understand nothing about art. I can't rhapsodize as lyrical as some other reviewers do. I can, however, tell you, that this is a book like no other. "This book is a showcase of everything I met on my way that touched me - people, wildlife, insects or beautiful skies. It is not a romanticised image of what the outback could very well have been. It is a picture of what it in fact is: a vast, inhospitable and beautiful piece of our planet"
When I first received the book I only had time to leaf through it once, just absorbing the images. Even the quick glance left a big impact. The next day I went through it again, this time also reading all the descriptions, the stories, the experiences that Thijs shares. I was impressed and surprised at the same time. Lost for words actually. This was so totally different from any photo book I had ever held in my hands. Very uncompromising, just like the country it portraits. It captures the harshness of it in high definition. It makes you not only see it, it makes you feel it, at times in an unsettling way. It's a totally different version of outback compared to what I am used to or what you will find in other Australian photo books. Thjis took his photos as he crossed Australia from south to north, from Adelaide to Darwin, but not on the tourist route. 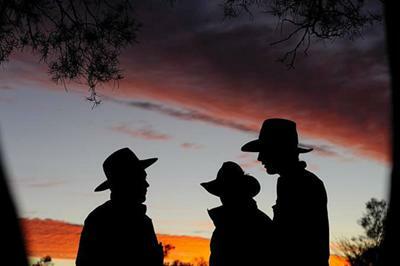 He will take you on the unsealed outback tracks that criss-cross the hottest and most remote part of our continent. Thjis did an amazing job of capturing it, capturing not only the beauty but also the desolation, the looming threat of it. You may wonder why and how people would live there, but they do. And you will meet them as well, in Thijs' images and in his words. And since I can't do the book justice with my words anyway, I suggest you visit Thijs' site and let the images speak for themselves instead. I vote this the most uncompromising book about the Australian outback I have seen to date.